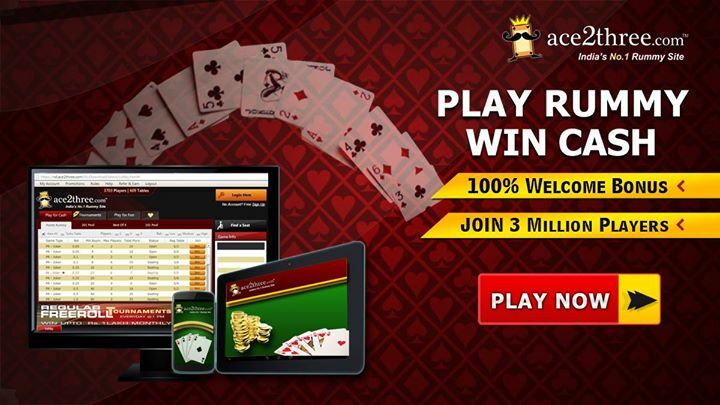 Ace2Three, the first online rummy website from India is also one of the best in providing the rummy excitement across the globe. Started with providing online version of classic rummy or 13 Cards Indian Rummy, Ace2Three slowly build its own variations of rummy games. Indian rummy, a cross between Rummy 500 and Gin Rummy soon became an entertainment medium with Indian and global players alike. Those who are signing up with Ace2Three for the first time will get Rs.1000 welcome bonus. They can play both free and cash games with the bonus amount they receive. You always have an option on the type of rummy game to play in Ace2Three. You can choose between Points Game and Pools Game depending on your expertise in rummy games. Why to Play in Ace2Three Rummy? Ace2Three is arguably one of the biggest Indian Rummy website with over thousands of players trying their skills on the cash tables. The website offers two variations of the rummy game, namely Points Rummy and Pool Rummy. Points Game is the fastest form of game where you can get chips from the opponents depending on the count or bet value. Whereas, Pools Game is a little different in which a player with minimum points at the end of the game wins. The Indian Rummy website has mentioned that their most popular types of Points game are 101 pool, 201 pool and Best of Three considering the number of players take part in the rummy tournaments. Ace2Three has recently announced 9 Player Table which you can join easily for more hours of unlimited fun with up to 9 players at once. The 9 player a table makes the game more challenging. With the inclusion of 3 decks of cards and huge cash to win, the game becomes more interesting and needs you to be on the top of your game to win rummy tournaments. Ace2Three makes the gameplay easy for the players by giving them the option to select lobbies. You can select between Standard Lobby, Easy View Lobby or can get access to your favorite rummy game by clicking on the “Favorites” tab if you have added any game earlier. If you want to be cash player, you need to purchase chips from the website. You can also avail extra real chips on your purchase because they usually bring more than a couple of amazing bonus offers per week. The payment in Ace2Three is carried away in a secured manner. There is a less than 90% chance of getting an error while you make a deposit or withdraw any money from the website. As rummy is a game of skill, the legality of playing rummy both online and offline in India is legal. So, Ace2Three also is a 100% legal site to play and enjoy online rummy games. We will rate this rummy website from India 4/5 and will rank this website as one of the best to learn the game as well as to make some real cash!